Pad thoroughly cleans several large rooms without rinsing,Wash or toss after use,Microfiber grabs dirt; washes clean,Machine washable up to 3 times,What is microfiber? 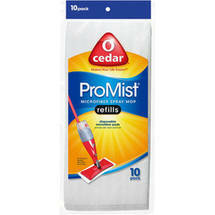 Millions of microscopic fibers that grab and hold dirt, dust and moisture. Leaves no residue. Traps dust and dirt.